Intense daily moisturizing and reduced appearance of wrinkles on dry skin, formulated with a combination of two active ingredient complexes: Urea technology and HYALURON-FILLER. EUCERIN HYALURON-FILLER EXTRA RICH Technology Day Care provides hydration intense and visibly reduces the wrinkles and fine lines of dryness. It contains a combination of two technologies from Anti-Aging Expertise and EUCERIN Dry Skin Expertise: Urea Technology (Urea and Lactic Acid) & HYALURON-FILLER Technology (Dual Molecular Hyaluronic Acid and Saponin) ). In addition, the Day Care has an anti-UVA protection to protect the skin from the harmful effects associated with this radiation, and in particular premature cutaneous aging due to these rays. With age, the skin tends to dry out, thus promoting the formation of early wrinkles. Its opposite is also true: skin dryness tends to accentuate the signs of aging. These two cutaneous phenomena are therefore closely linked. Day Care combines active ingredients that moisturize, fight wrinkles and protect against the harmful effects of UVA, all in one single treatment. Urea Technology improves the skin's ability to hold water, HYALURON-FILLER Technology visibly reduces the appearance of fine lines and wrinkles, and UVA filters help prevent premature aging due to UVA. Clinical studies under dermatological control confirm the high efficacy and cutaneous tolerance on very dry skin, which are suitable in addition to a treatment for psoriasis. The cream texture leaves a feeling of softness on the skin. 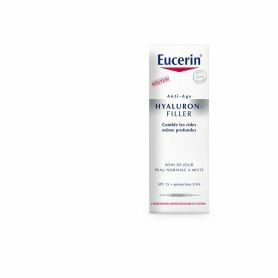 Apply a thin layer of EUCERIN HYALURON-FILLER EXTRA RICHE Day Care to your face and massage. No dyes, no perfume, no comedogenic, excellent makeup base.